'Big Bear Lake, California Is Above the Clouds', Big Bear Lake's non-hotel Vacations No one needs to tell us how busy life has become. 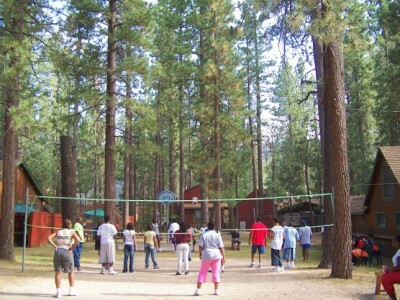 But, I have found an affordable release for stress and the place to find relaxation: Golden Bear Cottages in Big Bear Lake, California. Get ready for lots of Winter snow, skiing, snowboarding, Spring-Summer and Fall fishing, boating, charter fishing, hiking, an Alpine Slide, Moonridge Zoo, nature nights, hunting for gold, tubing, mountain biking, golf driving range and golf course, senic sky chair at Snow summit takes you from 7,000 to 8,500 ft. elevation. Temperatures tend to remain cool in the high mountains; even in the Summer it stays in the middle and upper 70's. Big Bear lake also offers horseback riding, wildlife viewing, shopping, parasailing, Zip line and 4x4 off road adventures, Sierra Belle sightseeing boat, and much more mountain fun! You can even take the Trolley and ride around the lake ($3 for the day). These are just a few of Don and Karen DiCarlo and Lisa and Len Duran's (owners of Golden Bear Cottages Resort) suggestions. They have researched all of the things to do in the mountains around Big Bear lake and compiled a wonderful custom guest book of activities, mountain nightlife, along with suggestions, and will happily answer your questions. During their first visit to Big Bear Lake, Don and Karen DiCarlo fell in love with the mountains and bought the Golden Bear Cottages over twelve years ago. When you walk among the 500 Pine trees that are around the Golden Bear Cottages, recreation area, and everywhere else within the 6 acre resort, you will know why. Some of these 200 year old trees measure from 4 to 5 feet wide. You have all the outdoor recreational facilities for adults and children without leaving the resort: heated pool, spa, sand lot volleyball, ping pong, horseshoes, basketball, shuffleboard, large cedar swings and slide and outdoor group meeting space for retreats. Summer movie nights bring everyone to the pool for free cartoons and a movie on their 60" big screen T. V., or sit around the large outdoor fire pit (weather permitting) at night to get together with the other guests. You can even use Golden Bear Cottage's Karaoke equipment, or choose from 100 or more board games and thousands of movies. They even have a quaint gift shop with everything Big Bear. 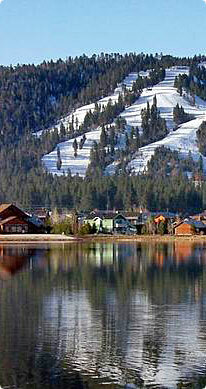 Whatever reason you are visiting Big Bear Lake, the Golden Bear Cottages Resort staff can assist you. If you are planning a wedding, they can help make all of the arrangements. How to Plan a Christian Retreat is their specialty. 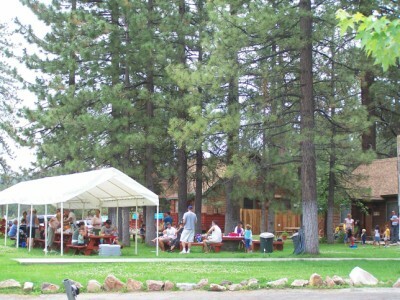 Groups, churches, clubs, and businesses visit Big Bear every year for meetings, retreats, family reunions, and parties. Many are returning guests to Golden Bear Cottages. Three of the families I met when I visited Golden Bear Cottages had stayed numerous times before, and make it an annual affair! Golden Bear Cottages are more than just cottages, they are actually historic small, medium and large size private mountain log homes. With 28 high altitude retreat cabins and a 3,800 square foot retreat lodge, they have room for couples, families, and as many as a 204 person group. 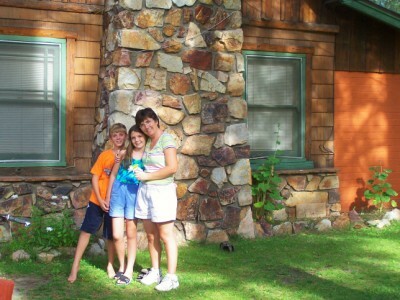 Each historic cabin and cottage is different, but they all have a fireplace, kitchen, and color T.V. 's with DVD and/or VCR and wi-fi. Their romantic separate Jacuzzi cabins seat up to 6 people. I love the Honeymoon Suite, a restored log cabin hunting lodge built in 1917. You can watch T. V., movies, or the crackling of the fire from the Jacuzzi. This cabin suite has a tall fence for privacy. The high log ceilings and bent twig swing in the front porch adds to the historic mountain atmosphere. Each cottage has it's own private driveway, patio, BBQ, and picnic table; you can still stay close to home, but visit a different world in Big Bear Lake. Golden Bear Cottages is truly an historic mountain property, not a five star hotel. If you are looking for a peaceful and quiet resort with a heated pool and spa, lots of outdoor activities and a family of staff that truly appreciates you and your family or group of any size, then this is the place for you! Cottages affordable off-season rates: $79 - 799; high season- $99 - 899; Discounted rates for military, law enforcement, senior citizens, AAA, large groups, and off-season week day specials. 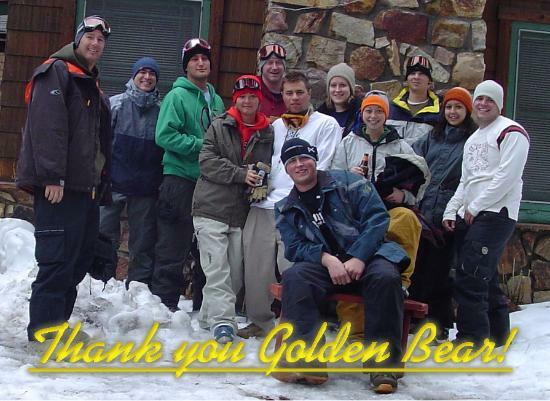 Golden Bear Cottages, celebrating over 80 years as great AAA approved rustic mountain family and group resort. Some cabins are pet friendly with fenced yards. 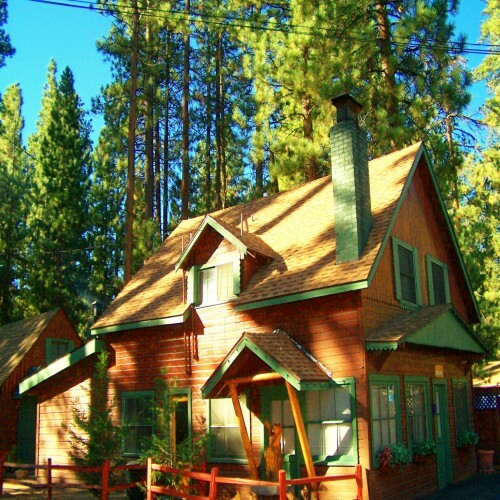 Visit Golden Bear Cottages at 39367 Big Bear Blvd., Big Bear Lake, CA. (800)461-1023, groups and retreats (909)866-4507, fax (909)866-9547. They speak Spanish too !Hablamos Espanol!